Carla shares Every Noise at Once which is a scatter-plot of every musical genre imaginable. We could spend days here. Seriously. With Music Map, type in the name of any composer/artist to generate a map of other music you are likely to enjoy. Impressive. For the example below, we selected Beethoven. Awesome that Frank Zappa is just a couple inches away! So far we’ve looked at tools for discovering musical genres and artists. 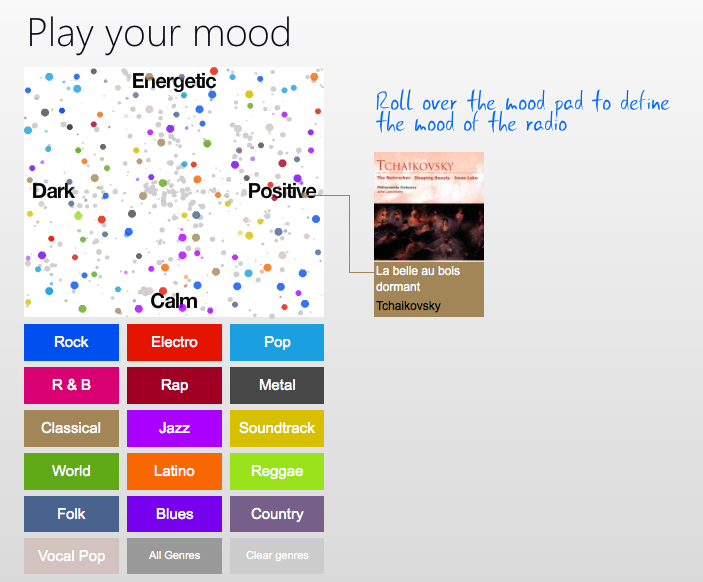 And with musicovery, we can hear what our mood sounds like! Do you ever listen to a song or piece of music and wish it would continue forever? Carla shares with us The Infinite Jukebox. Just click different parts of the circle to create your own infinite loop of the song/piece of music of your choice. Do you have a favorite destination for interactive music and data visualization? Let us know and we’ll add it to our next interactive music and data visualization post!